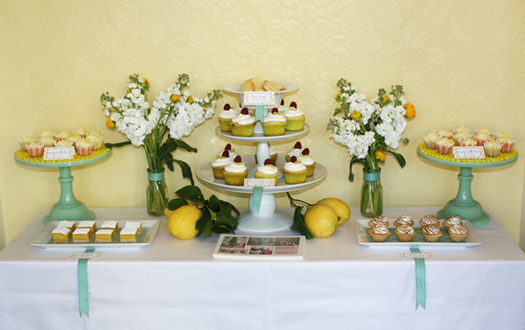 I recently created a variety of citrus treats for a lovely dessert table styled by Becca of Birthday Girl. 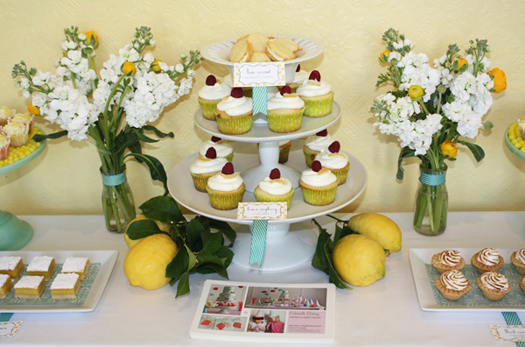 Becca did an amazing job creating the adorable graphics & pulling the table together with simple flowers & fresh lemons. 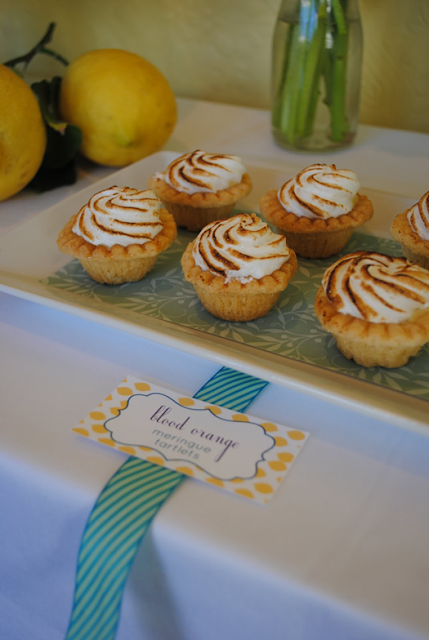 The treats included orange-vanilla bean mini cupcakes, lemon raspberry cupcakes, meyer lemon bars, blood orange meringue tartlets & coconut-lime sandwich cookies. The sleeper hit of the night was definitely the cookies. I have to admit, they were kind of a pain to make. The dough is super soft & required a ton of flour and patience when rolling them out. I skipped the step of freezing the dough before cutting them out and I don't recommend it. That being said, the result was really delicious. 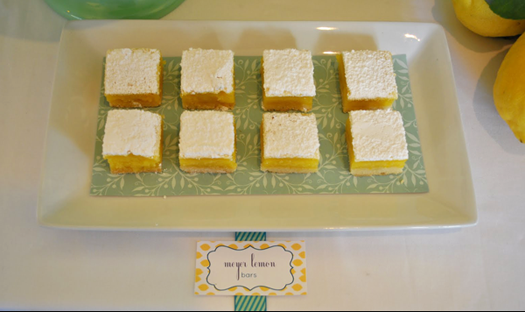 The cookies stay soft and chewy and the filling was super limey and refreshing. I might tinker with the recipe to make the dough a little easier to deal with, but they are definitely a keeper! Makes 24 or more sandwich cookies, depending on the size of your cookie cutter. I used a 1" cutter. 1. Whisk flour, baking powder and salt in a medium bowl. 2. Put butter and granulated sugar into a mixer bowl and beat in medium high speed til pale and fluffy, about 2 minutes. 3. Mix in the egg and vanilla. 4. Reduce speed to low and gradually mix in the flour mixture. 5. Stir in the coconut. 6. Shape dough into 2 discs and wrap each in plastic. Refridgerate until cold, about 30 minutes. 7. Preheat oven to 350 and get parchment lined baking sheets ready. 8. Take the discs out of the fridge and roll each out to 1/4" thickness, then pop them into the freezer for about 20 minutes. Then take them out of the freezer and cut out your shapes and pop them back into the freezer for another few minutes to firm up. 9. Place them onto your baking sheet and bake approximately 12 minutes, or til the edges are golden. 10. Cool completely on sheets on wire racks. 11. Fill cookies when cooled. Mix all the ingredients in a small bowl and place about one tablespoonful onto one cookie and top with another. Store cookies in the fridge in an airtight container. 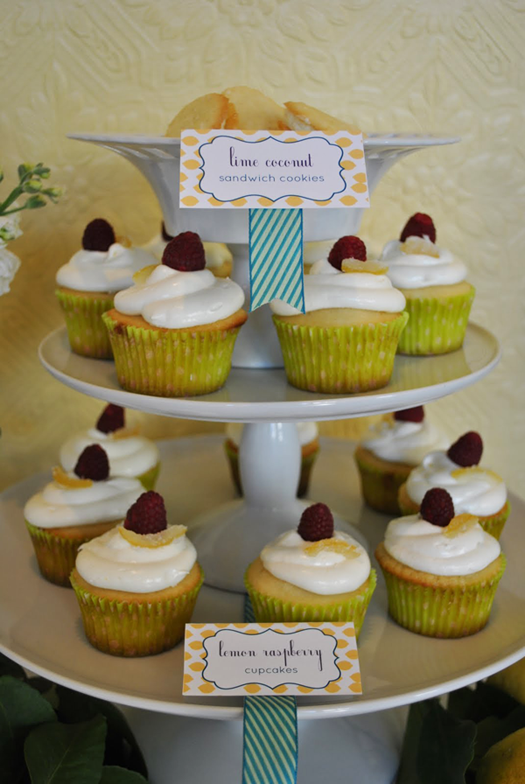 I really like the way the cupcake papers reflect the lime green tones of the cupcake. Such pretty yumminess. I just discovered your lovely blog. I'm just new into blogging this year & have just finished off my own blog on fashion & interior design.